Because last month’s newsletter article was written before the events of the Special General Conference, it was released at a time that many in our membership were experiencing a wide array of emotions. It is good that we took time during worship to acknowledge the pain that has been felt, and we were also privileged to experience immense grace from some of our members who shared why this congregation in Pacific Beach remains a beacon of light and hope. I wanted to share some updates over the course of the last several weeks, not only at the denominational level but also more locally. Among the first is how we have been covered in local press in the aftermath of the Conference. The Union-Tribune wrote an article quoting several United Methodist clergy and also produced a podcast interview with me. Several days later, the San Diego Gay and Lesbian News posted an interview. In addition, our own Administrative Council adopted a statement stating (in part): “We recommit ourselves to active and prophetic DISSENT. 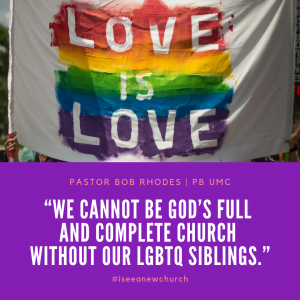 Our ministries and mission will not be defined by these exclusionary policies.” The full statement can be found on our website here. Author and Pastor Adam Hamilton has followed General Conference with passionate writing. In one post, he asserts, “I will not treat my gay and lesbian people as second class. I will not quietly accept the way backwards as an acceptable way for us to live together as United Methodists.” In another, he explores possible solutions for the future of the church that include radical restructuring or even creating a new denomination. Mainstream UMC is a group of lay and clergy that strongly advocated for the One Church Plan that did not pass at General Conference. At a debrief session held at Asbury UMC in Overland Park, KS, leaders from the organization noted that a core group of leaders including Mainstream UMC, Reconciling Ministries Network, and as many as 20 large church pastors were engaging in conversation about looking forward at ways to respond to the General Conference including a potential “divorce agreement” to leave the denomination. The California-Pacific Annual Conference is beginning to take action. Bishop Hagiya recently hosted a listening session specifically to hear from LGBTQ clergy. Out of this, a new task force is being formed to explore designing a future of inclusion in the church. In addition, our Conference is seeking ways to designate monies sent to the global church to minimize support of harmful and hateful theologies and policies. Most recently, a New York Times article alleged that some ballots cast at General Conference were cast improperly. Organizers and leaders of the UMC are investigating the claims, and it remains unclear what impact this will have on the results of the Conference. A number of dates are upcoming that may affect what we know and where we’ll go from here. The Judicial Council meets in late April to address the constitutionality of the Traditional Plan (much of which is expected to be thrown out). Our own Annual Conference Session is in mid-June, where we will explore our response at length. A conversation is expected as part of a Leadership Conference in Leawood, KS in late September. And finally, the next General Conference will be held in the first two weeks of May, 2020. I confess that I am frustrated by the pace of what is taking place. Even so, I suggest that one aim of the One Church Plan must remain on our minds: we are stronger together than we are separately. This congregation could explore extracting itself as a separate congregation from any denomination, but I fear this would separate us from the new thing that God is already doing in our midst. I commit some patience. I commit to show up. I commit to faith, hope, and love – most of all, love. May we continue to see the light that shines on the path before us.